It is almost certain that Samsung will launch the Galaxy smartwatch (or smartwatches if you consider all the variants) alongside the Galaxy Note 9 at the Unpacked event on August 9 in New York. The smartwatch, officially named as the Galaxy Watch, has been acquiring all the necessary regulatory approvals in the run-up to the launch, with the most prominent being the FCC approval earlier this month. 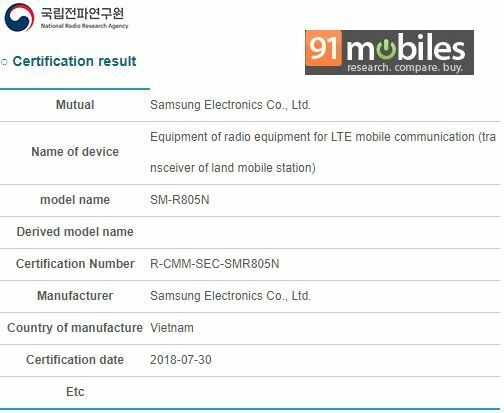 Today, the Galaxy Watch has cleared one more regulatory obstacle by receiving certification from the National Radio Research Agency (NRRA). Four different variants of the Galaxy Watch – SM-R800, SM-R805N, SM-R810, and SM-R815N – have been certified by the NRRA. The multiple variants probably refer to the rumored screen-size options and LTE versions. This certification doesn’t reveal anything noteworthy or new about these devices. We already know a lot about the upcoming Samsung smartwatch from previous leaks and regulatory approvals. Due to the change in branding from what should be the Gear S4 to the Galaxy Watch, there were many rumors about Samsung ditching the Tizen OS and opting for Google’s Wear OS. However, we reported exclusively a couple of weeks ago that the Galaxy Watch will come with Tizen 4.0 OS out of the box. Samsung accidentally revealed the Galaxy Watch on its website last week. With all these leaks, there is not much surprise left in terms of hardware when Samsung goes on stage to introduce the Galaxy Watch. Hopefully, the company has some innovative software features in store to get us excited about its first Tizen 4.0-based smartwatch.